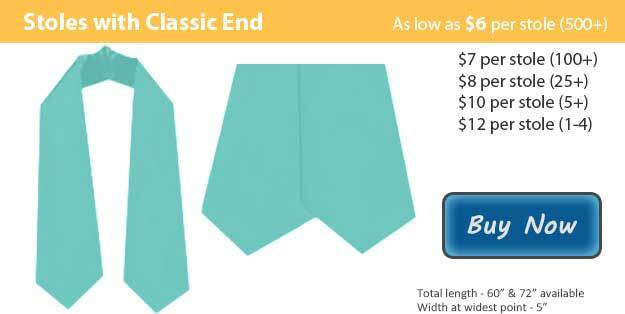 Graduation stoles in seafoam are an outstanding way to accent your graduation outfit. Graduation is right around the corner and here at Honors Graduation we have all the graduation gear you need to get you prepared for your big day. It is a monumental step in your journey to successfully reach this point, that's why it is so important to dress the part. As you accept your diploma or other degree, your family and close friends will all be there to cheer you on and join you in celebration. After putting in the years of hard work that it takes to make it to graduation you know now that you can do anything you set out to accomplish, no matter how difficult it may seem. It is a tradition commonly followed by graduating students all across the world to wear graduation attire at the time of their ceremony. Many graduates wear a cap and gown along with their choice of the many various graduation accessories out there. At Honors Graduation we have multiple package deals to get you ready for this monumental day in your life. In addition to graduation caps and robes, we have all of the accessories that you might be looking for as well. Our graduation stoles are available in a large variety of color, both as a solid color or with a trim, the trim being another color in order to contrast. Our stoles are available in either the classical shape or angled at the bottom to accommodate for your needs. Here at Honors Graduation we can also customize graduation stoles by embroidering them with the wording and or image of your choice.